Low Back Pain Treatment – Inflammation, IL-6 and the new FAR infrared treatment connection. I recently posted an article regarding drug-based Rheumatoid Arthritis treatment targeting the IL-6 protein. I was interested in the potential implications of a study by Wong et Al (1), showing that as well as pain relief, post knee surgery patients treated with FAR infrared exhibited reduced levels of the proinflammatory IL-6 protein. I raised the question whether the new FAR infrared modalities be an effective treatment aid for Rheumatoid Arthritis. Working so heavily with low back pain and IDD Therapy spinal decompression treatment, this got me thinking about inflammation, IL-6 and low back pain. What are the potential applications of new infrared modalities as a cost-effective tool to ease inflammation and reduce low back pain … without the need for steroid injections and anti-inflammatory medication? With regards to Low Back Pain, we observe on many occasions that patients using Thermedic infrared pads report pain relief beyond what might be expected from a standard conductive heating aid. I have written at various times that the humble “heat pad” offers more profound benefits than we might think, see evidence. Thus whilst looking at the Wong et al study showing reduced levels of IL-6 for knee pain post surgery using infrared, we can also see that elevated levels of IL-6 are associated with CLBP. Could Wong et al help us to explain more fully the observed benefits of FAR infrared for relieving low back pain? TherMedic is a new technology which uses a mains powered carbon-fabric element which emits FAR infrared. It replaces lamps. Worn against the body TherMedic provides a localised constant infrared heat/energy source. Evidence shows both thermal and non-thermal effects from the resonant energy for pain reduction for a variety of conditions. Most of the evidence comes from Asia where the technology is developed and being applied to many medical conditions. We expect that European academic interest will develop as awareness of the new technology and its applications spreads. Regular users of Thermedic for low back pain report “not being able to live without their TherMedic” infrared pad. Patients with sciatica report that their pain has disappeared which is surprsing for something viewed as a simple heat pad and used on the lower back. Rather than simple pain relief from heat and increased blood flow which “feels nice”, might Thermedic infrared have a deeper effect by helping to reduce levels of inflammation-causing IL-6 in LBP? There is clearly a lot to explore, but as you look into the new FAR infrared fabric application for low back pain relief, you will see that there is a lot more than meets the eye. Convention has it that heat should not be applied when there is inflammation. Having heard from people suffering with inflammation but reporting relief when using TherMedic Infrared, could the new infrared turn some of that conventional thinking about heat and inflammation on its head? Rheumatoid Arthritis Treatment – A link between drug treatments, new FAR infrared and targeting the IL-6 protein. Last month a news article in The Daily Express, a UK newspaper, appeared referencing a new drug treatment for Rheumatoid Arthritis (RA). The drug targets the IL-6 protein which is responsible for inflammation. This stimulated my memory banks for a different study for knee pain which I vaguely remembered made reference to an IL protein … hang on, it’s the IL-6 protein! Have I just discovered a link to a potential treatment for RA? Here is the extract from the article and a link, but read on. Now, anecdotally we hear countless testimonials from people with arthritis (not specifically RA) reporting significant pain relief from using TherMedic infrared ProWraps, as well as other conditions including low back pain, Frozen Shoulder and more. Some of these effects may be down to the thermal effects of sustained vasodilation but other studies detail non-thermal effects which may explain other significant properties and benefits of TherMedic FIR for pain relief, see evidence summary. For some people living with Rheumatoid Arthritis, medication does not always work and can include side-effects. The above paper looking at the application of FIR for knee arthroplasty and reduction of IL-6 protein is not a large double-blind randomised controlled trial. HOWEVER, in the context of this and other scientific evidence surrounding the re-emergence of FAR infrared, as well as the growing anecdotal evidence, there is surely a case for more detailed investigation into the potential applications of the new localised carbon-fabric infrared modality, TherMedic for the relief of pain caused by Rheumatoid Arthritis. This question may well be being addressed in Asia where the new carbon fabric infrared element was developed, but to the scientific community in the UK, the new technology is still unknown. That is changing. Interleukin-6 (IL-6) is an interleukin that acts as both a pro-inflammatory and anti-inflammatory cytokine. Expression of IL-6 is enhanced at the site of inflammation, and blockade of IL-6 and IL-6 signalling is effective at prevention and treatment in models of inflammatory diseases (including arthritis and colitis). Overall IL-6 is important – indeed, critical under certain conditions – to the development of persistent inflammation. I first came across infrared whilst using it with IDD Therapy spinal decompression. Initially I saw it as a simple heat modality but it quickly became apparent that there was a lot more to TherMedic than meets the eye. Steadfast Clinics distribute Thermedic in the UK. Sciatica or Back Pain? – Google statistics show us what people are actually looking for. Working with clinics treating herniated discs with IDD Therapy spinal decompression, I am interested to see back pain statistics and trends around the subject of back pain. 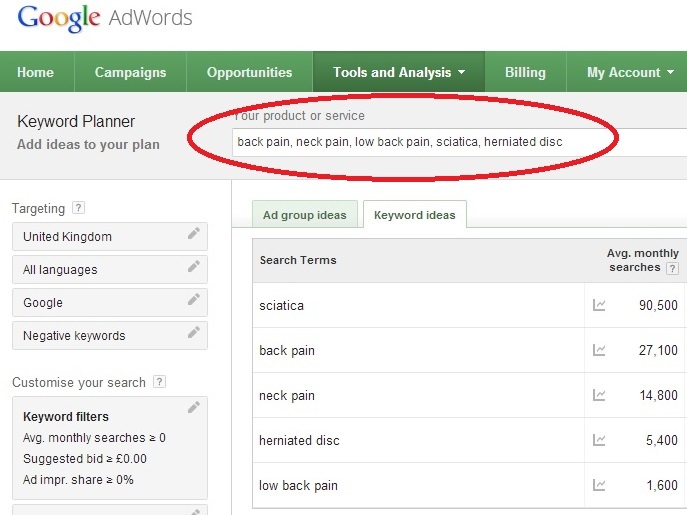 Whilst “Back Pain” is the number one musculoskeletal condition people visit their doctor for, is it really back pain they need help with or does Google search traffic data reveal something not factored into the statistics? Here below you can see the UK monthly search volume for certain keywords. 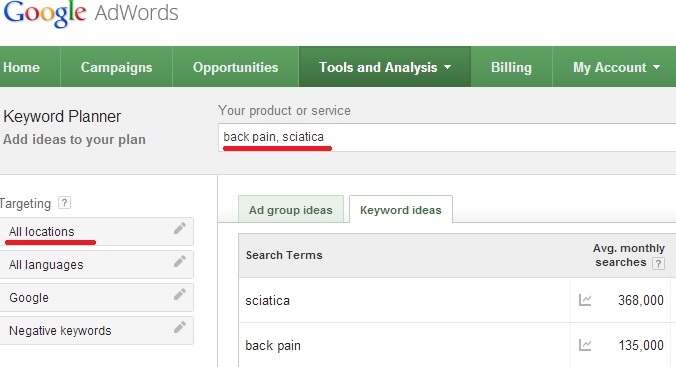 As can be seen, for every “back pain” search in Google, there are over three times as many searches for ‘sciatica’. Again we see the same trend. Is back pain more prevalent than sciatica? Is the pain of ‘sciatica’ less bearable than ‘back’ pain? Is it the latter which prompts proportionally more people to search for info/help with sciatica than back pain? Steadfast Clinics Ltd – Expanding IDD Therapy spinal decompression treatment for intervertebral discs and Thermedic Infrared Therapy Systems for joint pain and soft tissue healing. IDD Therapy Disc Clinic Conference – Great minds don’t always think alike! Will IDD Therapy work for every patient? Traction is Dead! With the demise of traction, how did IDD Therapy take over? Peter Jansen on Selling drinks in Africa and clinic marketing – valuable lessons for growing your clinic. Peter Simpson on Sciatica or Back Pain? – Google statistics show us what people are actually looking for. home gyms for sale on Taking ‘Before Photos’ to improve rehab exercise compliance – Lessons from the fitness and weight-loss industries. mt elizabeth singapore on Google search results for Physiotherapist vs Osteopath vs Chiropractor in the battle for the hearts and minds of back pain sufferers. steadfastclinics on Google search results for Physiotherapist vs Osteopath vs Chiropractor in the battle for the hearts and minds of back pain sufferers. We passionately support the IDD Therapy Disc Clinic network and are fully committed to evidence-based best practice. Your success is our success is your success.